The CV0204DVR is one of SVAT's feature packed digital video recorders. 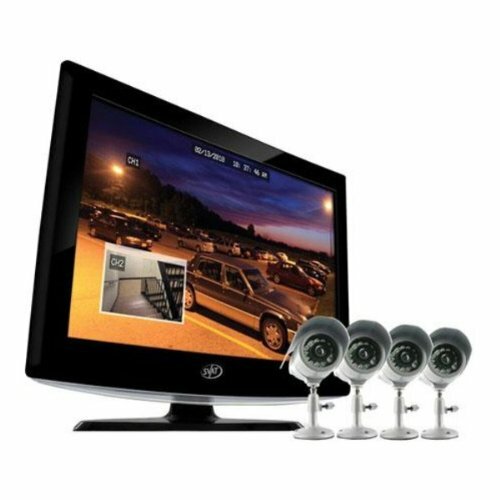 This complete system comes with four outdoor CCD cameras and can display all four (quad view) at the same time. Customize the recording and set a 24-hour recording schedule based on your preferences. You can choose to have the DVR record continuously during the day, then record only when motion is detected at night. And since each camera is equipped with night vision, you can view and record in total darkness! 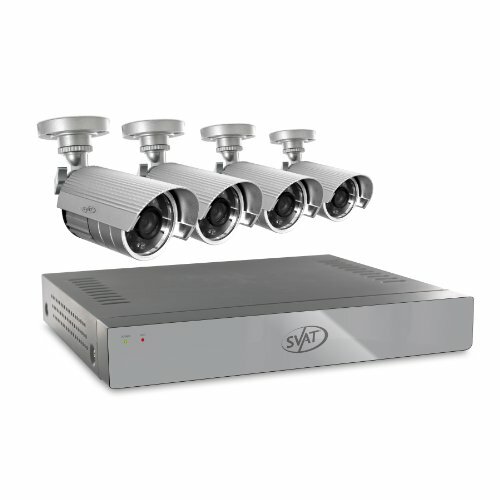 This DVR can record four different camera views (quad view) simultaneously and play it back at a smooth 30 frames per second. During playback you can even display each camera in full screen or view all four without losing quality. Finding your recorded footage is a breeze. Just search for the time and date it was recorded and the file will be displayed. Everything is stored on the DVR's internal 160GB hard drive allowing you weeks of recording. The DVR can be set to overwrite old footage when the drive does run out of space, allowing you continuous recording, year after year. The CV0204DVR also has a built-in internet server for remote viewing. Just plug the DVR into your internet connection and set it up with the included software. Then simply type in your IP address to monitor your home or business remotely, from any internet-enabled computer in the world! You can even play back recorded footage, save picture or movie files to your computer, and more, all through a web browser. This versatile surveillance system is an ideal solution for anyone who wants to monitor their property whether they're at home or away. "Thieves. Their goal in life is to take what’s yours - and they’ll break into your business or home to do it. Trust SVAT to make them think twice about your property. Statistics show buildings under surveillance intimidate burglars – often they won’t even bother and move on. But if they do manage to make it in, SVAT will help stop them from getting away with it. Our cameras deliver high-quality video that can assist in putting them away. Don’t give thieves a chance. Stop them with SVAT! Crisp and Detailed Video You Can Rely On Your security system is only worthwhile if you can actually see the person stealing from you. 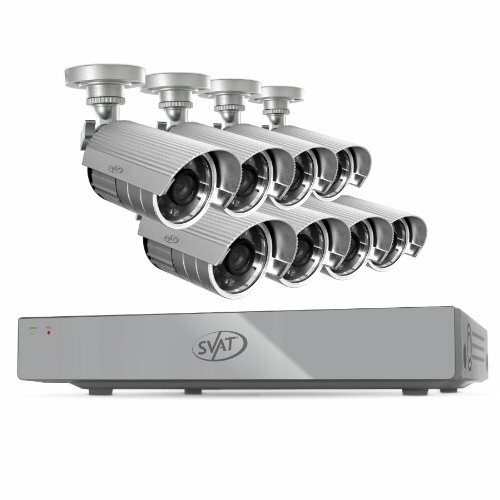 SVAT cameras are equipped with 480 TV lines of resolution. The resulting clear, crisp and accurate video feed will help put the criminal away. When Everyone Else is Asleep, Our Cameras Are Watching Closely SVAT cameras are equipped with night vision that automatically activates. Twenty-four infrared ClearVu LEDs provide crisp and detailed night imagery as you monitor from up to 75 feet away, even in complete darkness. So thieves may think they’re lurking in the dark but you can rest assured SVAT will see them. Rain or Snow Won’t Stop Us Criminals don’t take the night off if it’s raining. Neither do our cameras. They’re weather resistant and ensure optimal picture quality no matter what Mother Nature decides to throw at you, be it rain, hail or snow. The professional-grade aluminum housing, complete with sunshade, will protect against rust, deterioration and glare. So no matter what’s going on outside, SVAT will be ready. Secure Wiring Can’t Be Tampered With Thieves know dismantling a security system is a good way to get off scot free. But they’ll be disappointed with SVAT. Each camera’s cable runs through the cable mount and then directly into the wall, leaving no part of the cable exposed. Your footage will be secure. " 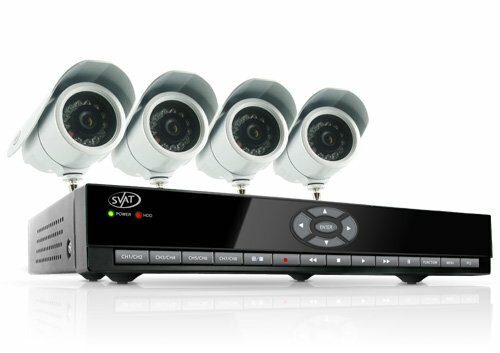 Feature-rich and easy to use, the SVAT CV502-4CH-002 complete DVR security system has been specifically designed with the do-it-yourself consumer in mind. This kit includes a four channel DVR with a built-in 500GB hard drive, four indoor/outdoor hi-res night vision CCD cameras, and all the accessories needed to start monitoring your property immediately. In addition, the interactive coaching menu guides you through the entire setup process, ensuring your DVR will be up and running in no time. Plus, industry-leading features such as smart phone access, H.264 compression, and convenient email alerts help you maximize your system while achieving the highest level of protection. iPhone and BlackBerry Compatible Record Over a Month of Footage Coaching iMenu Connect to a TV or Monitor Easily View Video Online with No Service Fees Stay Notified with Email Alerts Customize Your Camera Display 4 Professional Grade Weather Resistant Cameras See in the Dark with Automatic Night Vision Included Mouse and Remote 24/7 Scheduled Recording Password Protection Advanced Motion Activated Recording Multiple Easy Backup Options Search by Date, Time or Event Endless Location Options with 60ft of Wiring per Camera List of Contents: SVAT CV502-4CH-002 4 channel H.264 DVR with 500GB HDD, 4 indoor/outdoor hi-res night vision CCD cameras, IR remote control (batteries included), power adapter for DVR, four-to-one port power supply for cameras, power supply for cameras, 4 x 60ft camera extension wires, 1 x 10ft RJ-45 ethernet cable, 1 x 12ft RCA to RCA (male) wire, 6 x BNC connectors, mounting hardware, 1 x 6ft VGA cable, 4 x window warning stickers, quick start guide, software & manual CD, 24/7 lifetime live customer service, 1 year manufacturer's direct warranty. 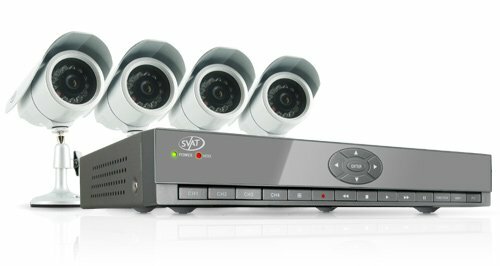 SVAT's GIGAXTREME 301 system can be used to monitor and record video and audio in any indoor or outdoor space at any time of the day. Digital Wireless Technology The GigaXtreme 301-Series comes equipped with Digital Wireless Technology that ensures there is no messy wiring involved when setting the system up. 2 Way Intercom Feature Communicate with visitors or employees from a distance using the 2 way intercom. SD Card Recording Feel comforted knowing you can check if anyone was on your property when you were not there. Convenient 24/7 Lifetime Live Customer Support Our customer support team can be reached by phone 24/7. Long Range Night Vision The indoor/outdoor cameras provide you with a clear, secure picture even when you monitor after-hours or in a dark location. Motion Detection Settings Motion settings give you flexibility so you can choose when the unit will start recording. 2 Indoor/Outdoor Wireless Cameras Included are 2 indoor/outdoor wireless color cameras that provide you with clear, crisp and enhanced video. 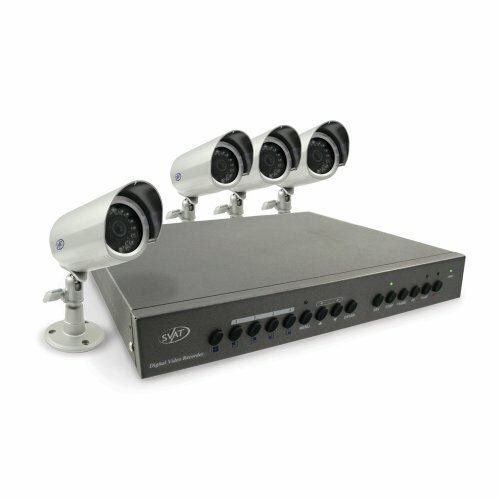 Expandable up to 4 Cameras This system can support a total of 4 cameras so you can monitor multiple offices, entrances and other outdoor areas. Remote Control Access Control your system directly from the monitor's joystick or from a distance with the included remote control. Easily Connects to a TV You have the option of connecting the GigaXtreme monitor to a television using the included AV wire. Extremely Easy to Set Up and Use This SVAT system functions just like a computer, with a mouse for pointing and clicking and an intuitive icon-based menu that provides prompts and coaching to assist you in navigating the system. It's even so simple to use it will begin recording as soon as it's plugged in. View Your Camera Footage From Anywhere In The World Whether monitoring your business or home, view your footage live online, anytime and anywhere with PC or Mac. You can also view footage on almost any smartphone, including iPhone, BlackBerry, Android, Windows Mobile, or Symbian, as well as on your iPad and most major tablets. Instant Email Alerts If Activity Detected Instantly know if suspicious activity is happening on your property. 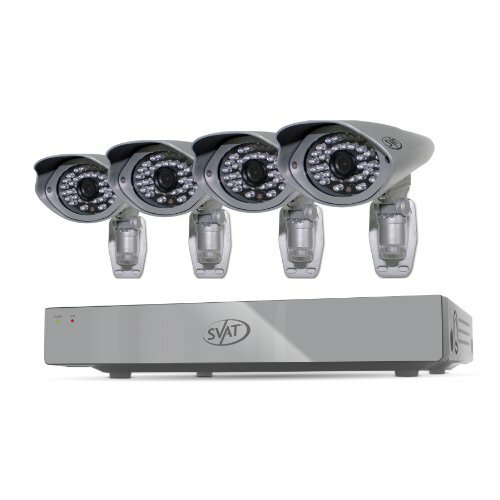 This SVAT system is designed to send you an email alert, complete with photo, if any motion is detected on your property or if any of your cameras experience video loss. 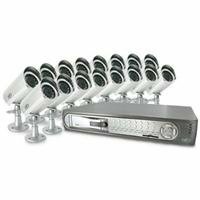 Crisp and Detailed Video You Can Rely On Your security system is only worthwhile if you can actually see the person stealing from you. SVAT cameras are equipped with 480 TV lines of resolution and the DVR records in D1 resolution, which is the equivalent of 704 x 480 pixels or DVD quality. The resulting clear, crisp and accurate video feed will help put the criminal away. Two Years' Worth of Footage Storage - and More If You Need It The included 500GB hard drive allows continuous monitoring and recording of over two years' worth of footage! Your DVR sends an alert when your memory space is full so that you can choose to overwrite old video or stop the unit from recording. The built-in USB port gives you the option of backing up and transferring your video footage with a USB flash drive or external USB hard drive. 11061 Features: -Number of light: 24. -65' Automatic night vision. -Sleek dome-shaped camera casing. -Adjustability: 360°. Product Type: -Surveillance camera. Color: -Silver. Camera Type: -Dome. Outdoor Use: -Yes. Connection Type: -Wired. Motion Sensor: -Yes. Night Vision: -Yes. Audio Recording: -Yes. Display Type: -TV/Monitor compatible. Number of Items Included: -1. Generic Specifications: -600TVL for Ultra hi-res imagery. -Resolution: 600 TVL. Generic Dimensions: -Overall dimensions: 4.3" H x 7.7" W x 7.3" D, 2.75 lbs. Dimensions: Overall Height - Top to Bottom: -4.3 Inches. Overall Width - Side to Side: -7.7 Inches. Overall Depth - Front to Back: -7.3 Inches. Overall Product Weight: -2.75 Pounds. Extremely Easy to Set Up and Use This SVAT system functions just like a computer, with a mouse for pointing and clicking and an intuitive icon-based menu that provides prompts and coaching to assist you in navigating the system. It's even so simple to use it will begin recording as soon as it's plugged in. View Your Camera Footage From Anywhere In The World Whether monitoring your business or home, view your camera footage live online, anytime and anywhere with PC or Mac. You can also view footage on almost any smartphone, including iPhone, BlackBerry, Android, Windows Mobile, or Symbian, as well as on your iPad and most major tablets. Instant Email Alerts If Activity Detected Instantly know if suspicious activity is happening on your property. 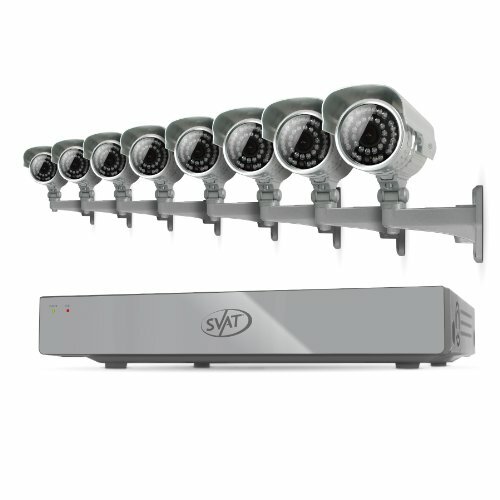 This SVAT system is designed to send you an email alert, complete with photo, if any motion is detected on your property or if any of your cameras experience video loss. Crisp and Detailed Video You Can Rely On Your security system is only worthwhile if you can actually see the person stealing from you. SVAT cameras are equipped with 480 TV lines of resolution and the DVR records in D1 resolution, which is the equivalent of 704 x 480 pixels or DVD quality. The resulting clear, crisp and accurate video feed will help put the criminal away. Two Years' Worth of Footage Storage - and More If You Need It The included 500GB hard drive allows continuous monitoring and recording of over two years' worth of footage! Your DVR sends an alert when your memory space is full so that you can choose to overwrite old video or stop the unit from recording. The built-in USB port gives you the option of backing up and transferring your video footage with a USB flash drive or external USB hard drive. 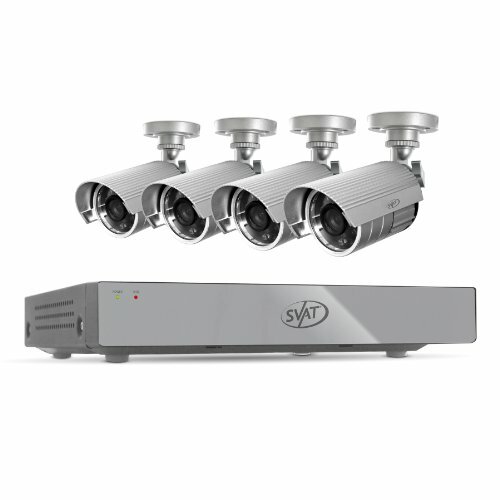 All-in-one 4 camera surveillance system. DVR integrated into a 19in LCD monitor. 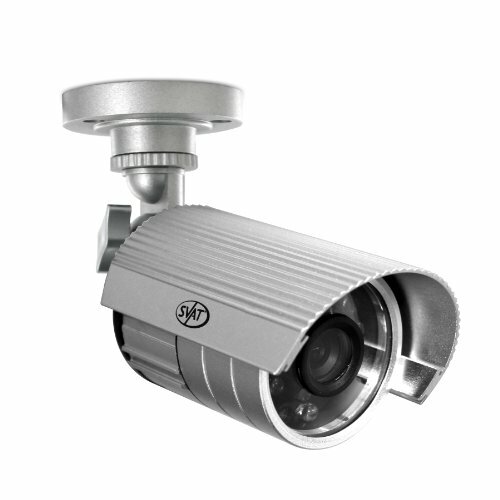 High-resolution indoor/outdoor cameras. Supports 8 channel H.264 recording. 500GB hard drive. Triplex functionality. If you're a home security novice, or are unsure of your property's needs, the SVAT CV301-8CH-002 is the perfect system for you. 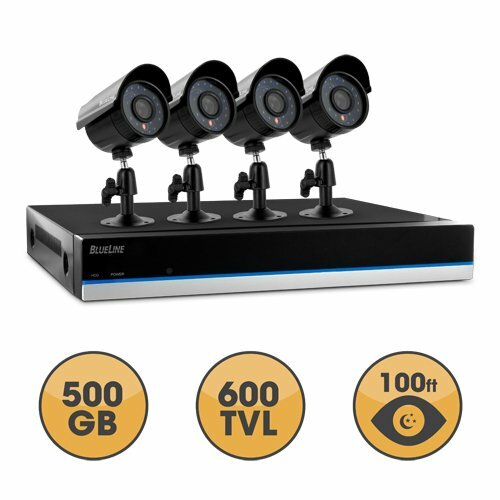 The 8 channel, 500GB hard drive DVR system comes packaged with four indoor/outdoor hi-res night vision cameras, and can expanded to include up to four more. As your business, family or property grows, so can the CV301-8CH-002. In addition, the interactive coaching menu guides you through the entire setup process, ensuring your DVR will be up and running in no time. Plus, industry-leading features such as smart phone access, worldwide online viewing, H.264 compression, help you maximize your system while achieving the highest level of protection. Smart Phone Compatible H.264 Compression Saves Disk Space View Video Online with No Service Fees Coaching iMenu We'll Get You Online with Our 24/7 Lifetime Live Customer Support 4 Professional Grade Weather Resistant Cameras See in the Dark with Automatic Night Vision Expandable System up to 8 Cameras Multiple Easy Backup Options List of Contents: SVAT CV301-8CH-002 8 channel H.264 DVR with 500GB HDD, 4 indoor/outdoor hi-res night vision CCD cameras, IR remote control (batteries included), power adapter for DVR, four-to-one port power supply for cameras, 4 x 60ft 4 PIN DIN to RCA (male) power cables, 1 x 10ft RJ-45 ethernet cable, 5 x RCA to BNC connectors, mounting hardware, 4 x window warning stickers, quick start guide, instruction manual, software CD, 24/7 lifetime live customer support, 1 year manufacturer's direct warranty. Extremely Easy to Set Up and Use This SVAT system functions just like a computer, with a mouse for pointing and clicking and an intuitive icon-based menu that provides prompts and coaching to assist you in navigating the system. It's even so simple to use it will begin recording as soon as it's plugged in. View Your Camera Footage From Anywhere In The World Whether monitoring your business or home, view your footage live online, anytime and anywhere with PC or Mac. You can also view footage on almost any smartphone, including iPhone, BlackBerry, Android, Windows Mobile, or Symbian, as well as on your iPad and most major tablets. Instant Email Alerts If Activity Detected Instantly know if suspicious activity is happening on your property. 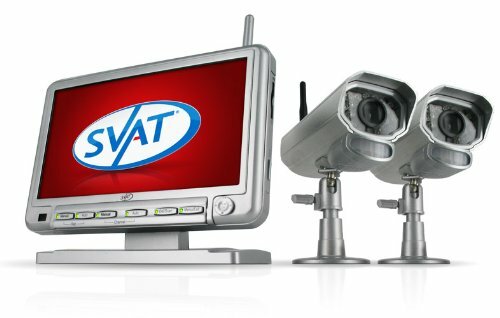 This SVAT system is designed to send you an email alert, complete with photo, if any motion is detected on your property or if any of your cameras experience video loss. Crisp and Detailed Video You Can Rely On Your security system is only worthwhile if you can actually see the person stealing from you. 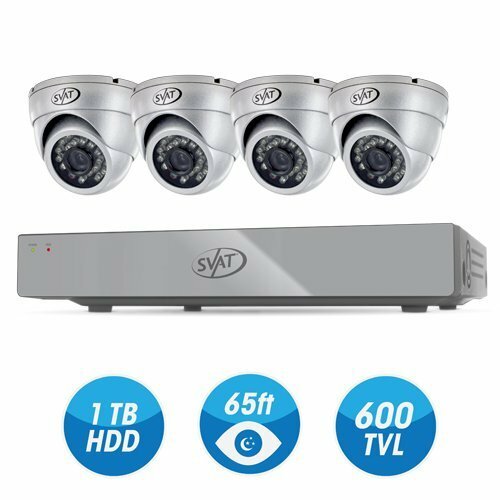 SVAT cameras are equipped with 600 TV lines of resolution and the DVR records in D1 resolution, which is the equivalent of 704 x 480 pixels or DVD quality. The resulting clear, crisp and accurate video feed will help put the criminal away. Two Years' Worth of Footage Storage - and More If You Need It The included 500GB hard drive allows continuous monitoring and recording of over two years' worth of footage! Your DVR sends an alert when your memory space is full so that you can choose to overwrite old video or stop the unit from recording. The built-in USB port gives you the option of backing up and transferring your video footage with a USB flash drive or external USB hard drive. And if you need to expand your storage even further, you can choose to record only when motion is detected. The natural choice for installers and contractors and those who demand ultimate peace of mind, SVAT® PRO can protect you or your client's investment and keep your building safe and crime-free. 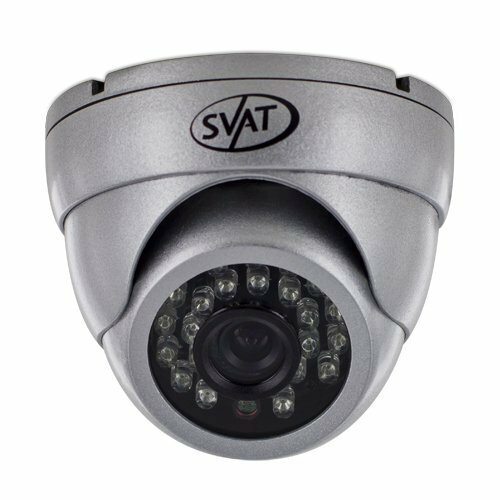 The patented sleek, modern appearance of SVAT PRO cameras is complemented by its durable, vandal-resistant design while the system offers the hassle-free installation and functionality you expect from SVAT. In addition to its good looks, PRO systems are ideal for protecting a wide range of outdoor applications and larger locations including building perimeters and parking lots. 1TB Delivers four years of memory The included 1 TB HDD allows for continuous monitoring and can store over four years' worth of recorded footage. Maximize available memory with motion activated recording and H.264 compression technology. DVR alerts will activate to notify user when HDD is full. Back up and transfer footage to USB flash drive or external hard drive via USB port. Ultra hi-res, color enhanced imagery 600 TV lines of resolution bring you crisp, ultra hi-res video. In addition, when the lighting conditions are unfavorable our Advanced IR filter will automatically activate. The enhanced image processing filter purifies reds, greens, yellows and blacks, that may have otherwise appeared washed out or faded leaving you with superior color-accurate video footage important for identification purposes. 110ft of night vision at zero lux Experience high-resolution, low-light performance in zero illumination from up to 110ft from the camera's position. The PRO camera automatically activates infrared illumination with 38IR LEDs allowing for clear identification of objects in complete darkness.